Image Drywall & Paint is a full service Alaska painting contractor. We can handle both residential and commercial interior and exterior painting projects. Please see the photos below to see a few examples some of our recent work. On average painted surfaces make up 70% to 80% of any home or office. 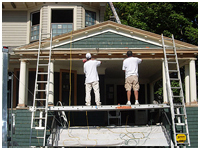 Therefore it is vital that you have a reliable painting contractor who will ensure that your project is at its best. We use the best quality paints and our system of application will insure durability and beauty. As Alaska painting contractors can handle any job from new homes to tenant improvements as well as remodels and renovations. Not every Alaska painting contractor is capable of handling all phases of your interior paint project. We can handle it all from water or oil based applications to stain and varnish. We paint all surfaces including natural wood finishes. From Victorian multi colored homes, log oil applications, or commercial concrete buildings, we do it all. When you are looking for an Alaska painting contractor for your next exterior paint project we hope you will choose us.